Before specializing in pediatrics, I could have never imagined how much stress picky eating could cause parents and caregivers. At first parents may feel their child just likes certain foods more than others. Then maybe they don’t like fruits and vegetables. Then parents may begin to watch what other kids eat, how much they eat, how often they eat, how easy meal time may be for other parents, etc. They then begin “noticing” their kid may only eat processed foods, beige foods, warm foods, or food not prepared at home! The worrisome thoughts begin to creep in. Is my child’s diet negatively impacting their brain development?! What about their growth potential?! Is it making them groggy and unable to absorb what their learning in school? Will they begin to fall behind in school? What if there is something medically wrong with them now because their will not eat meat or vegetables! Are they dehydrating themselves?! I can continue to list the scary thoughts I have heard, but it’s beginning to make me anxious, and I definitely don’t want to make you anxious! Well I have great news! This is not a situation where stressing about it and “being on top of it” will make it better. Actually, it will make it way worse. My advice as a pediatric dietitian? Ignore it! Draw as little attention to your child’s picky eating behaviors as possible. Serve them what you want them to eat and that is the end of it. Children pick up on our stressors. If meal time is a stressful time for you and you’re worried about what they will eat, they pick up on it and it has become a negative experience for them. Negative experiences are obviously unenjoyable and children can act out – hence picky eating. How do parents begin to combat picky eating behaviors? Here is Feed To Succeed’s list! I can promise you, as parents, we implement these tips at home also. Cook and serve only what you want your child to eat. Don’t be a “short-order” cook. You are the parent, so you know what is best for your child. Make meals family events, and serve everyone the same foods. It’s okay to have one “safe” item out for the picky child (such as plain bread or rice). Eat meals together as often as possible. Serve the same meal to everyone. Model good eating behaviors by eating a variety of nutritious foods in front of your children. Offer a new food item daily and expect it to take up to 15 attempts with a particularly picky eater before he/she will accept the food. Consider it progress for extremely picky kids if they simply allow the food to sit on their plate. Offer 3 meals and 2 snacks at approximately the same time every day. Allow a minimum of 2 hours between meals/snacks. Offer nothing to eat or drink between meals/snacks except water. Always eat at the table. Serve all meals and snacks at the table with screens turned off. Eat together as a family as often as possible. Offer milk with every meal. Soda, juice, Kool-Aid, and sweet tea do not add anything nutritious to your child’s diet, so they are not necessary. Offer foods from each food group at most meals. Limit meal time to 20-30 minutes. If your child tantrums, asks for something else, refuses to eat, or gets up from the table, wait 15 minutes and try again. If the problem continues, end the meal or snack and wait until the next scheduled meal/snack time to offer anything (except water). Do not make a big deal out of this or give it attention. Do not make it like a punishment. Just be matter of fact. Keep your emotions in check, and stay in control of the situation. 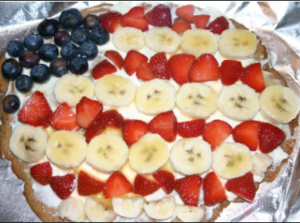 Happy Fourth of July weekend to all our Feed to Succeed families! Make sure to celebrate with family time and of course, lots of good eats! 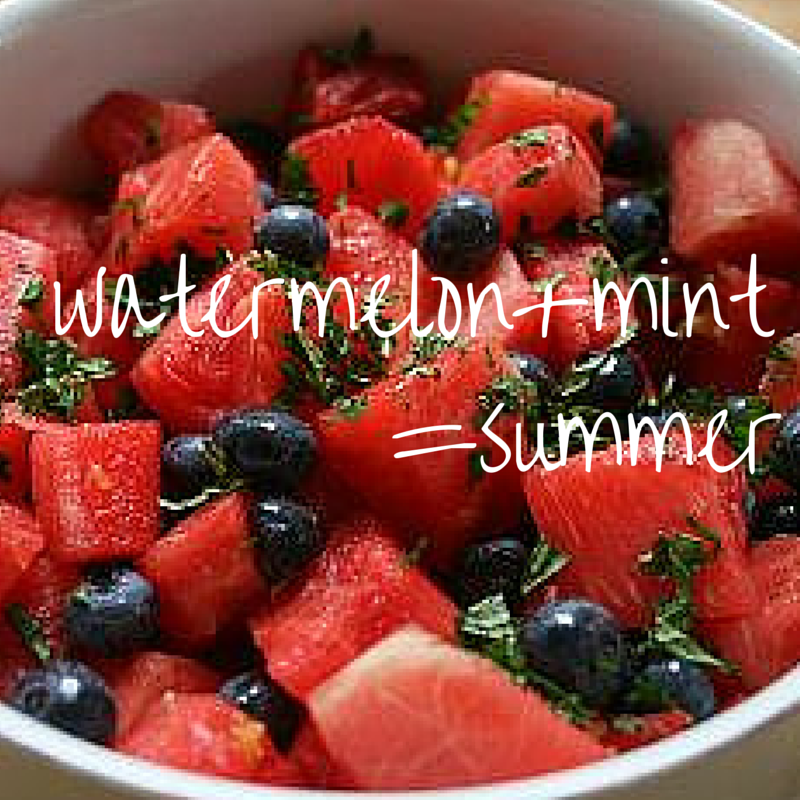 Try adding fresh mint leaves to your fruit salad. 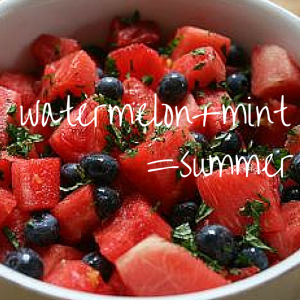 It tastes like summer! 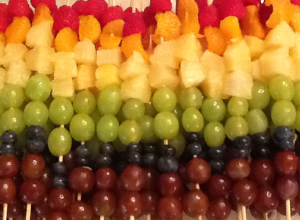 Put your kids to work on these skewers, and they’re guaranteed to eat it! Believe it or not, FPIES, Food protein-induced enterocolitis, was beginning of my love story with Feed to Succeed. I first met Betsy, the owner of Feed To Succeed, at a dinner lecture on FPIES. We quickly realized we had lots in common in the pediatric nutrition world, which eventually led to me becoming a pediatric dietitian with Feed to Succeed. 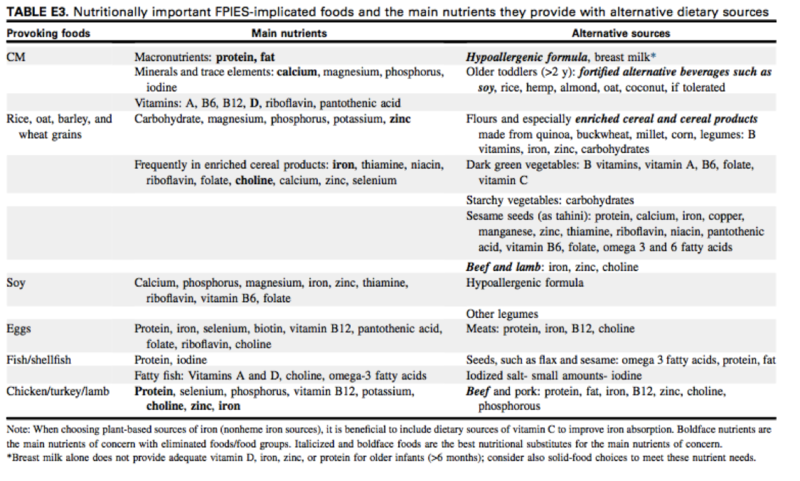 So what exactly is food protein-induced enterocolits (FPIES)? Well food allergies can be divided into IgE-mediated and non-IgE mediated reactions. FPIES is a non-IgE mediated food allergy. This means IgE antibodies do not cause this reaction to food. Since IgE antibodies are not involved, this allergic reaction to food is delayed (anywhere from several hours to several days) and causes symptoms over a long period of time (as opposed to anaphylaxis or throat closing reaction). FPIES presents with gastrointestinal symptoms such as vomiting, diarrhea and dehydration. The most common culprits are cows milk (CM), soy, and grain. However, any food may cause FPIES. If your child is presenting with these gastrointestinal symptoms, it is important to discuss this with your pediatrician or pediatric gastroenterologist. If a diagnosis of FPIES is made, working with a pediatric dietitian is important in order to make diet modification to help manage their nutrition. Nutritional management will consist of eliminating the food or foods that your child or infant is allergic to, while making sure they continue to receive all the necessary nutrients. For example, if your child or infant is allergic to cows’ milk, they will need diet modification to assure they are receiving adequate protein, calcium and phosphorus (among other nutrients). The Journal of Allergy and Clinical Immunology recently published guidelines on the management of FPIES. In those guidelines, they have a couple of tables with really useful nutrition information. One of them nicely outlines what foods can be incorporated into you child or infant’s diet to assure appropriate nutrition in eliminating some of the most common FPIES triggers. 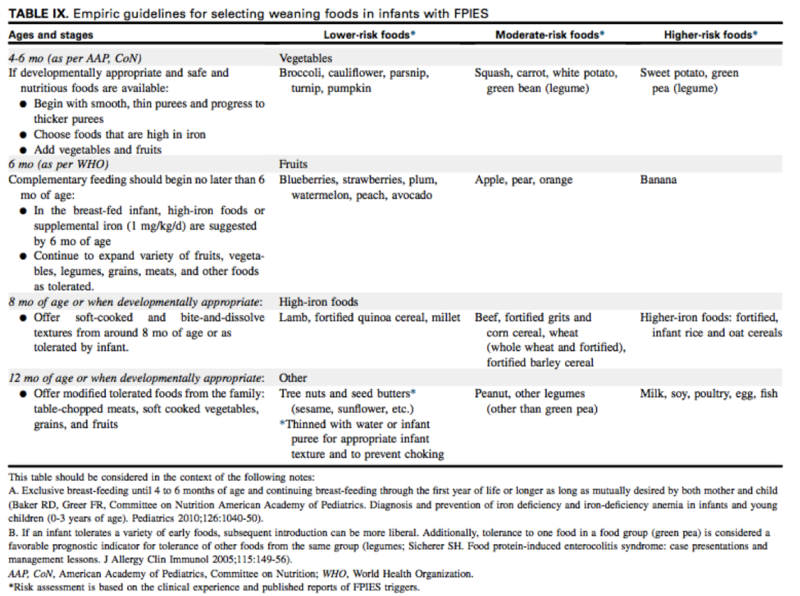 These guidelines also provide a table for introducing foods (or weaning from formula if CM is the trigger) to your infant diagnosed with FPIES. Please keep in mind, with a diagnosis of FPIES, it is imperative to work closely with a pediatric gastroenterologist and pediatric dietitian for the correct medical management and nutritional management of your child. While these guidelines are helpful and informative, they do not substitute working with medical professionals. Nowak-Węgrzyn, Anna, et al. “International consensus guidelines for the diagnosis and management of food protein–induced enterocolitis syndrome: Executive summary—Workgroup Report of the Adverse Reactions to Foods Committee, American Academy of Allergy, Asthma & Immunology.” Journal of Allergy and Clinical Immunology 139.4 (2017): 1111-1126.